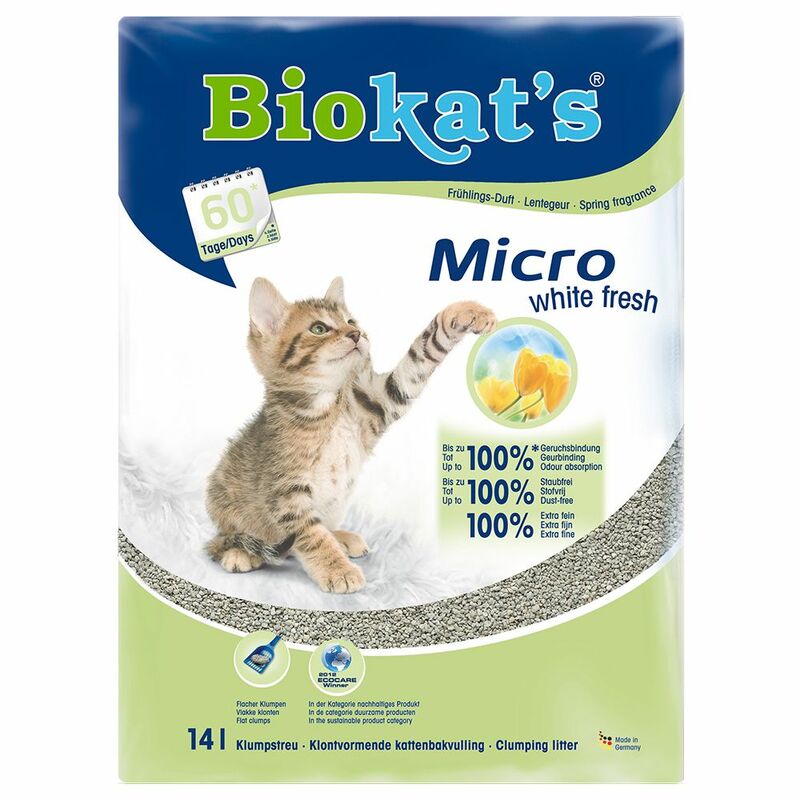 Biokat's Micro White Fresh is a natural clay clumping litter with fine white grains which are very popular amongst cat owners because of their high absorbency. Cats also prefer fine grains because they are kinder on the paws. Biokat's Micro White Fresh is made from especially fine, white grains and is up to 100% dust-free. This fine grained litter has a great, fresh springtime smell. It is also extremely absorbent. It binds all liquids immediately, forming clumps which retain not only liquid but also any nasty odours. Biokat's Micro White Fresh is made from premium natural clay which is very effective, absorbing all odours and liquid. Biokat's is the hygienic, efficient way to keep your cat's litter tray fresh and clean. This product may vary slightly in colour or contain mineral deposits, none of which affects the quality of this product. Biokat's Micro White Fresh cat litter: Clumping cat litter made from 100% natural clay Very fine, white grains which are kind to the paws Made only using premium quality clay Absorbs odours up to 100% Up to 100% dust-free With the fresh scent of spring Absorbency you can depend on Forms into flat clumps Winner of Ecocare Award 2012 Biokat's Micro White Fresh – A very special fine-grained cat litter with the great smell of spring!.